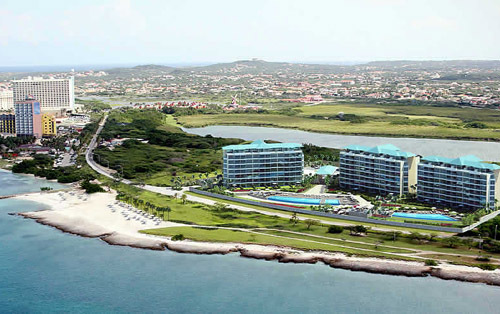 Eagle Beach on tropical Aruba will be the location of a new luxury condo resort. Scheduled to open March 1, 2014, the luxurious Blue Residences is an upscale condominium resort for discerning vacationers who desire the best. The Blue Residences resort will feature three towers that offer amazing and unobstructed views of the ocean. Elevated ceilings in the bedrooms, living rooms and dining rooms, private Jacuzzi terraces, fully loaded kitchens featuring upscale appliances and wireless Internet throughout are just some of the key luxury amenities available for resort guests. Blue Residences is still under construction and each tower will open on different dates. The first tower debuts on March 1, 2014 with two five-bedroom penthouses, four three-bedroom penthouses, 12 three-bedroom units and 24 two-bedroom units, totaling 42 units. The second tower will open May 2014 and the third is scheduled to open on January 2015. Pricing for deluxe hotel rooms begin at $120 per night during the summer season. One-bedroom apartment suites will go for $180 per night (two-, three- and five-bedroom units are also available at discounted rates). offer elevated ceilings, balcony, upscale appliances and electronics, fully-equipped kitchen, wireless Internet, living and dining room, cable TV, and a washer and dryer. In addition, all ground floor suites at Blue Residences will feature a private Jacuzzi terrace. Deluxe ocean view hotel rooms with no kitchen are also available upon request. Found only four miles from Blue Residences is Oranjestad, Aruba’s capital city. It offers both the charm of a quaint seaside village along with the allure of a cosmopolitan, international tourist destination featuring stylish shops, gourmet restaurants, nightclubs and casinos. For those who love the outdoors and want to enjoy the great Aruba weather, visitors can try various water sports at Eagle Beach and golf privileges at two nearby courses, including the 18-hole Tierra del Sol, which was designed by Robert Trent Jones. Blue Residences resort guest will also enjoy numerous on-site amenities such as – a private beach protected by a jetty, full-service spa, fitness center, two infinity swimming pools, upscale restaurant for your dining pleasure plus a bar, mini market and deli and a landscaped sundeck. If you would like to book a reservation at the luxury Blue Residences resort on Aruba’s Eagle Beach, please contact The Life of Luxury and we can assist with all your travel reservations.